The Invisible Book is a book produced in limited edition at the affordable price of €0. It will work as a digital book too, on any platform. The edition is limited to 100 copies (neither numbered nor signed). This is a product without a single fault, available at the lowest price possible. The book was made as a reaction to both the trend of decreasing booksales and the trend of increasing expectations from audiences. Published by Elisabeth Tonnard, Leerdam, April 2012. The book’s first edition was sold out on the day of its release. A second edition became available in June 2012. It too was limited to 100 copies, neither numbered nor signed, but all made to perfection and available at the price of €0. A stipulation came with the second edition: each purchaser could only buy one copy. The second edition is also sold out, the last remaining copies are held for future exhibitions. If you would still like to obtain a copy of the book, follow this link to the German site of eBay, where artist Joachim Schmid is occasionally offering for sale the first edition copies he bought immediately after the launch of the book (note the auctions are not always up, in that case contact Joachim). The book is included in the collections of Erfgoedbibliotheek Hendrik Conscience, International Center of Photography, John M. Flaxman Library at School of The Art Institute of Chicago (Joan Flasch collection), Kunstbibliothek (Berlin), Museum Boijmans van Beuningen, National Library of The Netherlands (Koninklijke Bibliotheek), Tate Library, and University of the Arts London (Chelsea College of Art and Design) where you can go and attempt to see it. The book was shortlisted in the 2013 Artists’ Books of the Moment Award, Art Gallery of York University, Canada. It was shown in a number of exhibitions, amongst others at the Van Abbe museum and at the Koninklijke Bibliotheek. You can read an excellent discussion of the book on the London Review of Books blog, written by Gill Partington. There is also an elaborate chapter on the book in Annette Gilbert’s Im toten Winkel der Literatur, Wilhelm Fink Verlag, 2018. Mangels lesbarer Objekte lässt The Invisible Book all jene Äußerlichkeiten des Publikationsprozesses ins Sichtfeld treten, die die ihrerseits unsichtbaren, aber höchst wirksamen Begleitumstände seiner Existenz bilden. Annette Gilbert in Kunstforum, 256, September-Oktober 2018. 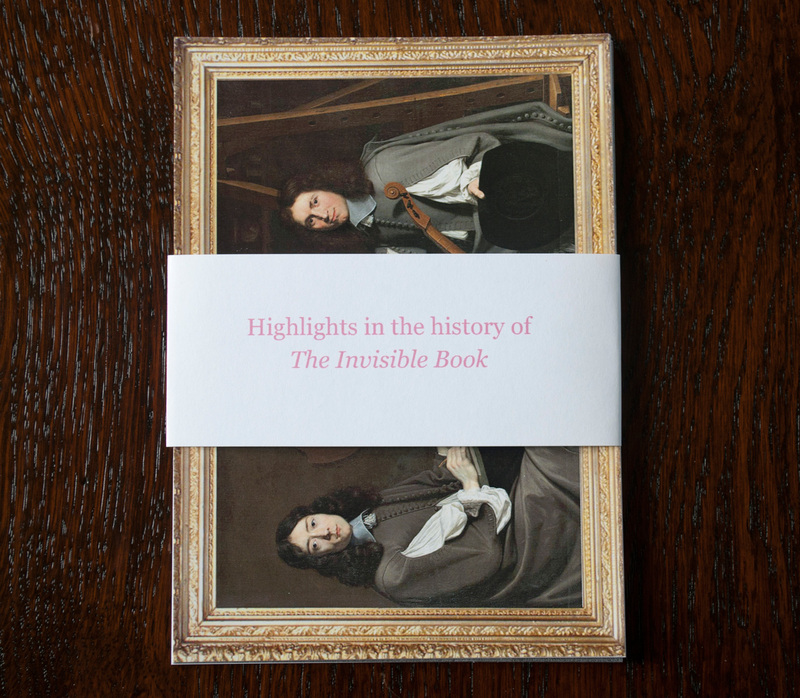 In order to shed some light on the nebulous history of The Invisible Book, a set of visible postcards was published in August 2013. From an early discussion about the book in 1654, to Robert Walser’s sterling 1925 review and Diane Simpson’s legendary marathon reading in 1980, discover some of the highlights in the book’s history through this set of six cards. The set is priced at € 5 plus shipping and available in my webshop. Or order by email. Ah, my love, the glory of works which have been lost for ever, of treatises which today are mere titles, of libraries which burned down, of statues which were demolished! How blessed with absurdity are the artists who set fire to a beautiful work! Or the artists who could have made a beautiful work but deliberately made it ordinary! Or the great poets of silence who, knowing they were capable of witing an absolutely perfect work, preferred to crown it with the decision never to write it. (For an imperfect work, it makes no difference.) How much more beautiful the Mona Lisa would be if we couldn’t see it! And if someone were to rob it just to burn it, what an artist he would be, even greater than the one who painted it! Why is art beautiful? Because it is useless. Why is life ugly? Because it’s all aims, objectives and intentions. All of its roads are for going from one point to another. If only we could have a road connecting a place no one ever leaves from to a place where no one goes! If only someone would devote his life to building a road from the middle of one field to the middle of another – a road that would be useful if extended at each end, but that would sublimely remain as only the middle stretch of a road!